Providing gentle and nurturing doula care for your birth and beyond. This granola. Wow. I have been trying for some time to come up with the perfect adjective to describe how absolutely delicious it is. The word, “delicious” doesn’t seem to do it justice by any means! Instead, more fitting would be descriptives such as, “scrumptious”, “completely satisfying”, “delectable”, and “mouthwatering”. I mean, seriously—I have made four batches already since recently coming across the recipe by Kristine from Kristine’s Kitchen: Nourishing Your Family and Home .You simply must try it! Not only is it simple, but it also is gluten-free, nutritious, and satisfying. Pair it with your favorite whole milk yogurt (Stonyfield has excellent flavor) or milk of choice, and you have yourself a bowl full of goodness. Or skip the milk and yogurt altogether, and instead, enjoy this granola by the handfuls! I’ve even thrown in a few add-ins such as raisins, chocolate chips, or dates when I dish up this treat. Absolutely delightful! Plus, a little side note to the nursing mama: This is great for boosting that milk supply! So don’t wait! Go ahead, whip up a batch, and enjoy. Note: The recipe listed below does contain my tweaks, but certainly do go check out Kristine’s original recipe, “Four Ingredient Peanut Butter Granola. In fact, stay a while, and bookmark some of her other great recipes on the blog as well! use parchment for the fact that it makes clean up easier. 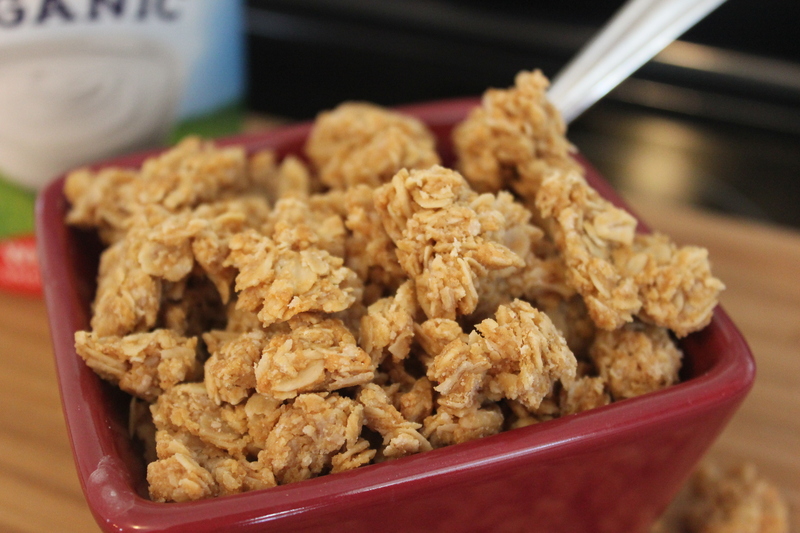 2) In a large bowl, add in the 5 cups of gluten-free oats. Set this aside. you remove it from the oven, but it will harden and form those delicious chunks as it cools! Store in an airtight container and enjoy! And make another batch, my friends! *Thank you to Kristine for the original recipe for this granola! For more of Kristine’s delicious recipes, go check out Kristine’s Kitchen: Nourishing Your Family and Home!